It is well known that guano is a very good fertilizer for many plants. Fact is, nature needs time for that source of fertilizer to convert to the plant useful compounds. In many plants grown in covered cultivation, the cycle is too short to complete this natural process in time for the plants benefit. In that case, the guano fertilizer adds little to nothing for the crops. With our guano extract, we offer a product to which this natural processhas progressed already. When this extract is provided to the crops via the gift water, the plant has very fast access to the minerals supplied by the guano. All of this completely through a entirely biological achieved process. The released fertilizers, which arise during this process, make an additive that is directly and completely absorbed by the plant. 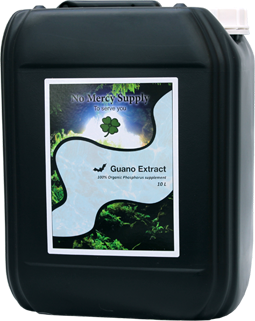 Use the Guano Extract in the ratio of 1:100. in addition to your normal feeding schedule (Sweet Jane) add 1 liter to 100 liters of gift water to plants in bloom until the final stage of fruit development. We recommend the use of bacterial together with the guano extract to ensure rapid development of the natural balance within the medium you are using. Guano extract provides a higher yield and better refined taste of the final product. Because the guano extract is a totally organic natural product, the color and composition may vary slightly over time.